Captain Freymann had Mr. Midshipman Raley go up on deck this morning to hoist the Blue Peter, and it is my understanding that the Captain wishes to depart Bermuda with the next tide. The winter is nearly over and the Captain and Master are of the opinion that the American ships will begin attempting to slip out of port again, if they have not already begun to do so. There are but a few liberty men remaining ashore, and once word gets round the island that the ships in Castle Harbour have begun to fly the Blue Peter, I imagine the sailors will begin returning in great numbers. The men ashore from the Acasta are of the more trust-worthy sort, else they would not have been allowed off the ship. And, Bermuda is such a small island, there are not many places a sailor could hide away and not be discover'd. We return to our blockade of the port of Baltimore. I must finish my letters and get them ashore before we depart! BLUE PETER. 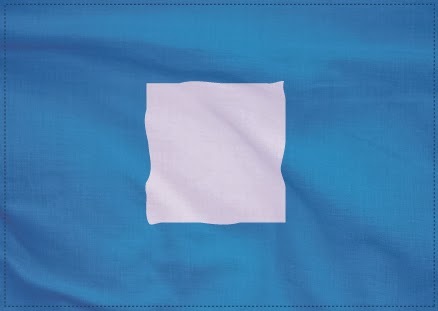 A flag, "blue pierced with white," was used in the British Navy from 1777 as a general recall flag. In a quarter of a century the term "blue peter" was used by all to designate this flag. 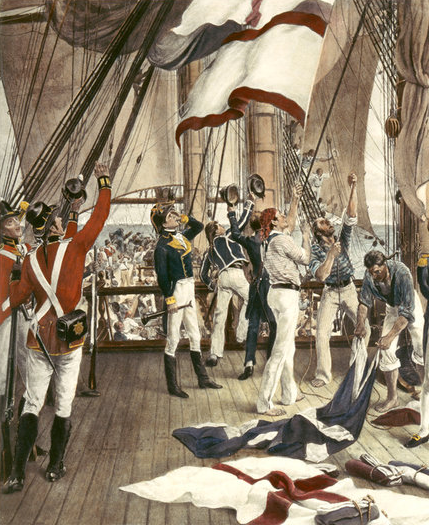 Civilians knew its significance, for merchant ships and convoys in the French wars would not sail until the escorting man-of-war hoisted the blue peter for passengers to come aboard. Naval Ceremonies, Customs, and Traditions 4th Ed. by William P. Mack and Royal W. Connell.